Ever since the NFL lockout ended, a lot of teams around the league have had to kick it into high gear with not much time to re-sign players, make trades and get their hands on talented free agents around the league. Along with trying to improve their squads by looking elsewhere around the NFL, there are quite a few teams in the league that also had to lockup their superstars to contract extensions before the NFL regular season gets underway. With some pretty big-names around the NFL like Peyton Manning (Indianapolis Colts), Larry Fitzgerald (Arizona Cardinals), Frank Gore (San Francisco 49ers), Drew Brees (New Orleans Saints), Michael Vick (Philadelphia Eagles) and Chris Johnson (Tennessee Titans) looking for contract extensions, their teams had a tough task ahead of them, but four out of the six players above were able to get the extensions they wanted and secure their futures with their current teams. The one player that seemed to be more suborn than any other superstar in the league about a contract extension was Tennessee Titans running back Chris Johnson. With Johnson wanting to become the highest paid running back in the league and then some, the Titans were debating about possibly trading their three-time Pro Bowler instead of agreeing to his high priced contract demands. Fortunately, despite all the demands and the enormous contract that Chris Johnson wanted, the Tennessee Titans eventually caved in and gave their superstar running back exactly what he wanted. Reportedly, the Tennessee Titans have agreed to sign Chris Johnson to a four-year contract extension worth about $53 million dollars. That is about $13 million dollars per season which is about $5 million dollars more than the highest paid running back in the league which is Steven Jackson of the St. Louis Rams ($8 million per season). Not only has Chris Johnson secured one of the biggest contracts in NFL history for a running back, but if somehow or someway things don’t work out between the Tennessee Titans and the three-time Pro Bowler over the next four years, the contract has $30 million guaranteed. That is an enormous amount of money to guarantee a player at the running back position. With running backs going down left and right during the NFL regular season, it is difficult to sign players at this position for an extended amount of time as they usually can’t play at a high level for a long time in the NFL. 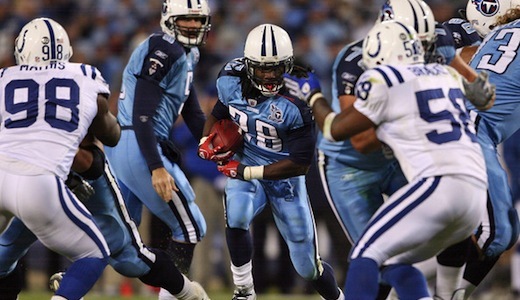 Even though this may be the case with running backs, the Tennessee Titans must have come to the conclusion that signing Chris Johnson to a long-term deal at the amount he wanted was the better move that trading him during the regular season. Personally, I believe that Chris Johnson is one of the best running backs in the league and could help this team get back to the playoffs over the next couple of seasons, but I don’t believe he is worth what they paid.